John Preus has brought into being a “Beast” at the Hyde Park Art Center; a two-story, wooden construction shaped in the form of a bull and designed to swallow incoming visitors into its large hollow belly. 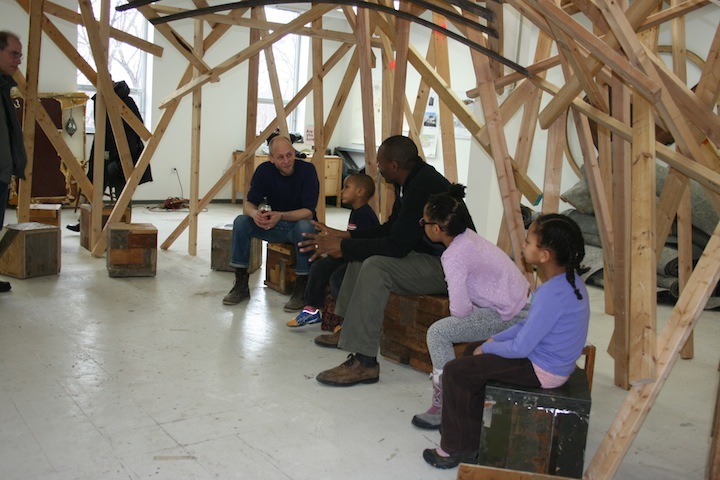 This massive site-specific installation, modeled after the grand interiors of a cathedral structure and composed mostly of old furniture from Chicago Public Schools, is to function as a new platform for public dialogue. The product of a yearlong residency at the center, “The Beast” will host many educational and cultural activities over the coming months. This is Preus’ first solo museum exhibition. With this project, Preus was firstly and largely influenced by the most unique feature of Hyde Park Art Center’s building: the garage doors located on the side of its main gallery. These shutters, which remain closed for most exhibitions, will be pulled up for the duration of this show and lead directly to the belly of “The Beast,” an interior communal space that will house hanging sculptures, rocking chairs, a ping pong table, a piano and even a porch swing made of old CPS desks. “I like to treat the materials I use as archeological objects and transform them to become useful in a new way, while revealing the history embedded within them,” says Preus. Preus comes from a long line of Lutheran pastors and is the first to break from this tradition of religious learning. His parents were missionaries and as a result he spent some of his childhood in Tanzania—a place that sparked his interest in trash and the importance of re-use. He abandoned his ancestry in order to adopt a more physical approach to community building and use his design skills to promote a different kind of conviction—that of shared creative engagement, an idea he feels is slowly being sacrificed because of current economic conditions. Furniture from closed-down Chicago Public Schools especially signifies a “divestment in the public sphere,” he says. As an artist, contractor, designer, teacher and musician he covers a lot of ground with his practice but is best known for his design and fabrication work on the Dorchester Projects, a community venue started by artist Theaster Gates. Conceived in a similar spirit, his other endeavors almost always involve people working in corporation, including “The Beast,” which couldn’t have come together without the help of many collaborators including Jim Duignan, Iker Gil, Jamie Kalven, Laura Shaeffer and others. John Preus, “The Beast,” shows at Hyde Park Art Center, 5020 South Cornell, through August 3.